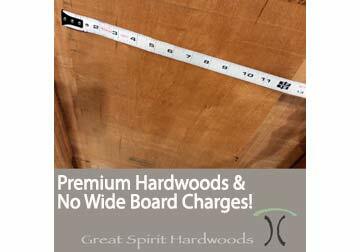 Great Spirit Hardwoods | Solid Hardwood Lumber Priced per Board Foot. 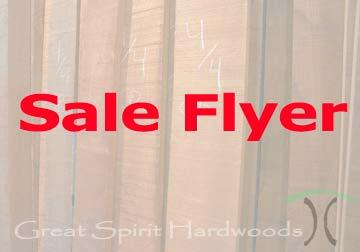 Our select kiln dried hardwoods will add to your bottom line, increase your profit margin on your next job with fair pricing and quality you can depend on. 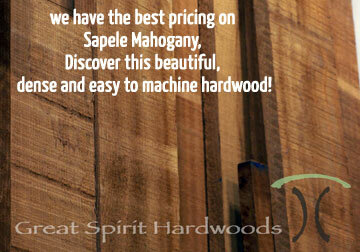 We offer quality hardwood lumber in many species. 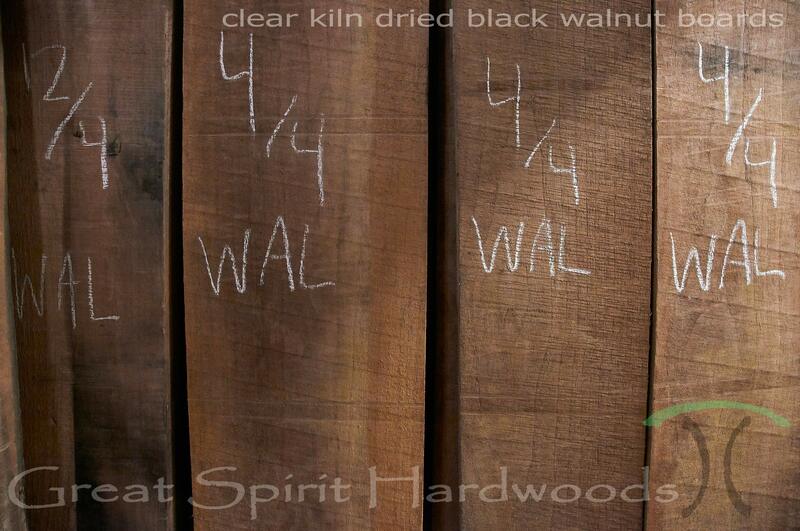 Our hardwoods are kiln dried, are thick for their grade and are of select or better grade. We offer hardwoods rough and skip planed with enough room to work with. Hardwood boards are of premium quality and are flat enough to yield common usable thicknesses after flattening and surfacing in their total length. 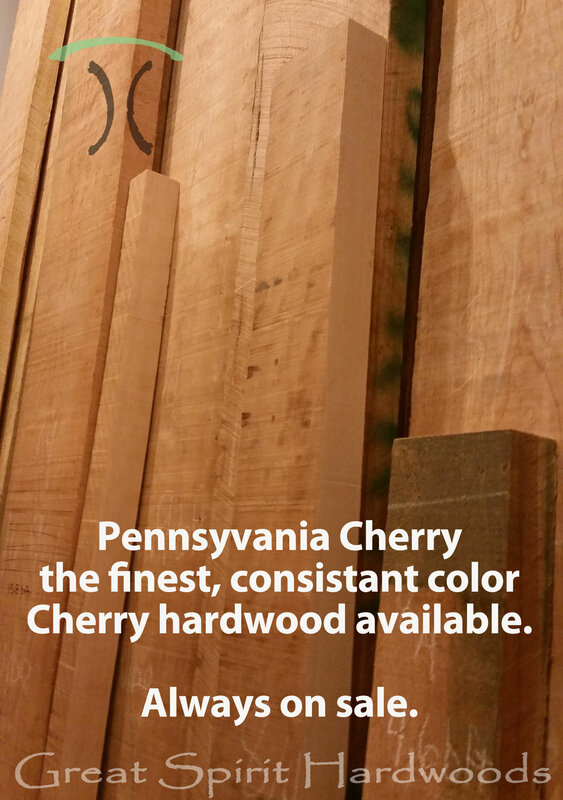 For example, our 8/4 Cherry is a full 2" thick and our 4/4 Sapele is 1.0625" thick when in rough form. We do not sell common grade hardwood lumber and you will not have to worry about the tragic waste involved in using twisted or warped boards. Using our quality hardwood lumber will add to your bottom line due to price and through the dependable quality of materials. 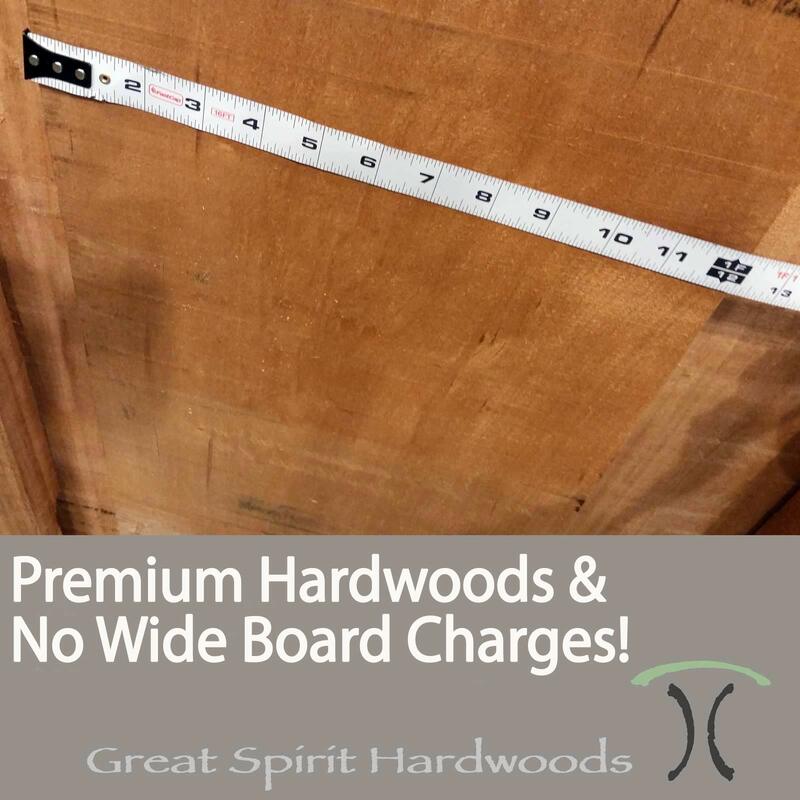 Note: We do not charge extra for wide boards in our hardwood lumber store. Feel free to compare our pricing to that of Owl, The Hardwood Connection and other local wood stores! 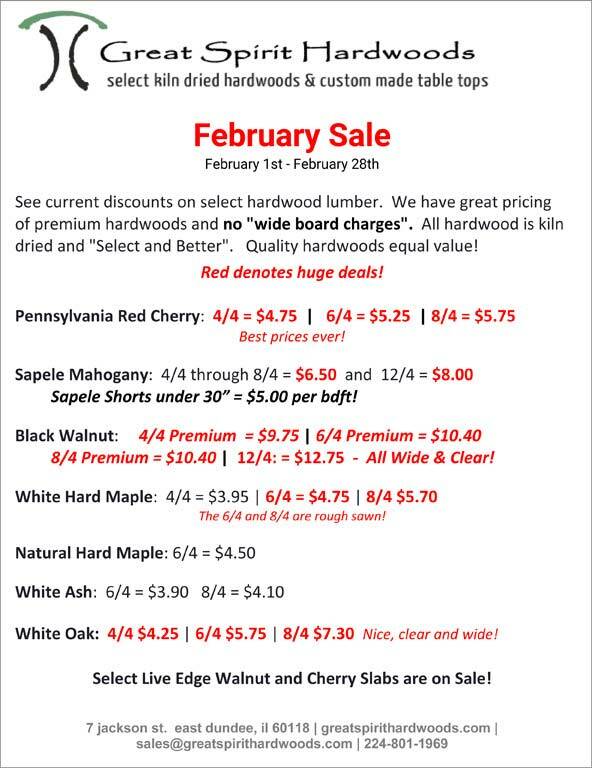 Examples or our regular hardwood lumber pricing. check latest sales flyer! 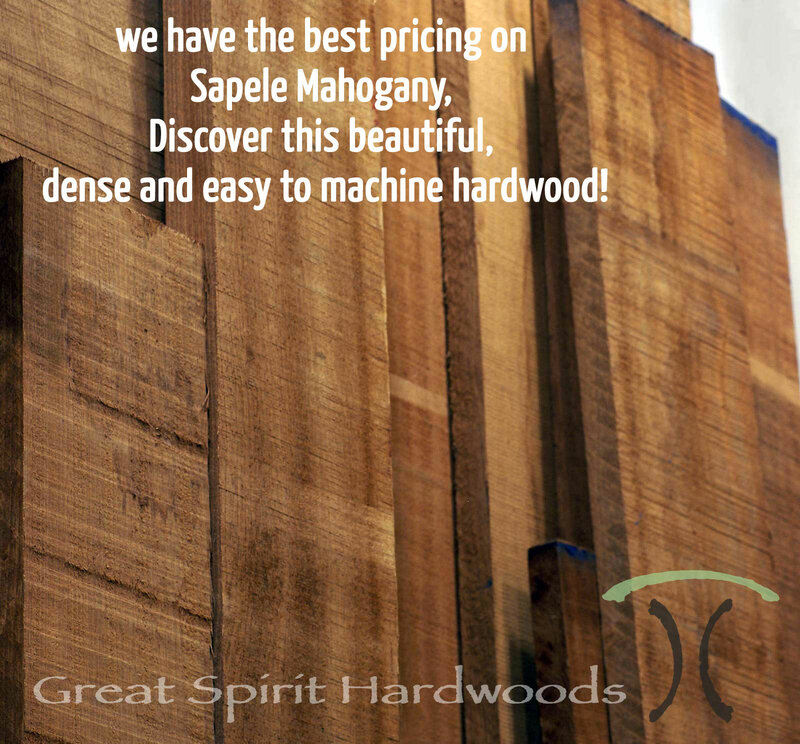 Offering sales prices during our pre opening period on special orders of domestic and exotic hardwoods. 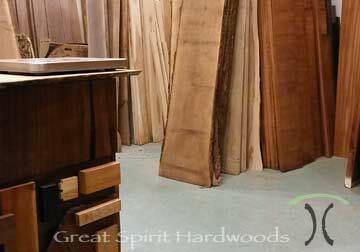 Aside from the stock we have on hand at our hardwood lumber and live edge slab store, we offer a "special order hardwood service" that passes our buying power onto our clients and fellow woodworkers. We combine stock orders with those of fellow woodworkers to lower the cost of materials which will increase your profit margin. Quantities of 100 Board feet of a species are usually required but the savings are so great, it is like receiving free lumber. 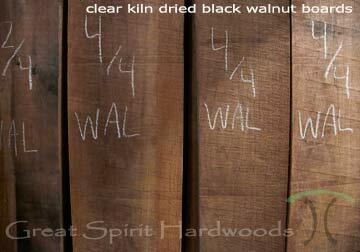 As with all of our hardwood lumber, special orders are of prime quality select or better kiln dried hardwoods. Special order pricing not available on top of any current sale pricing. Special "width sorts" will requaire additional cost as we are charged those from our suppliers. Examples of recent pricing to our fellow woodworkers, 100 BdFt and above without "wide board" charges! 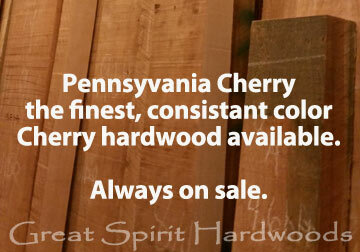 Cherry, Appalachian 90/70 red heartwood. Beautiful, clear and flat in nice widths 7" and up. Sapele Mahogany - Ribbon or Flat - Up to 24" Wide! These are only a few examples of what we can offer to fellow woodworkers, cabinetmakers and hobbiests. We also offer machining, jointing, wide belt sanding, glue-ups and make large tops for our fellow woodworkers. Give us a try, we are not big but we want to save you money. 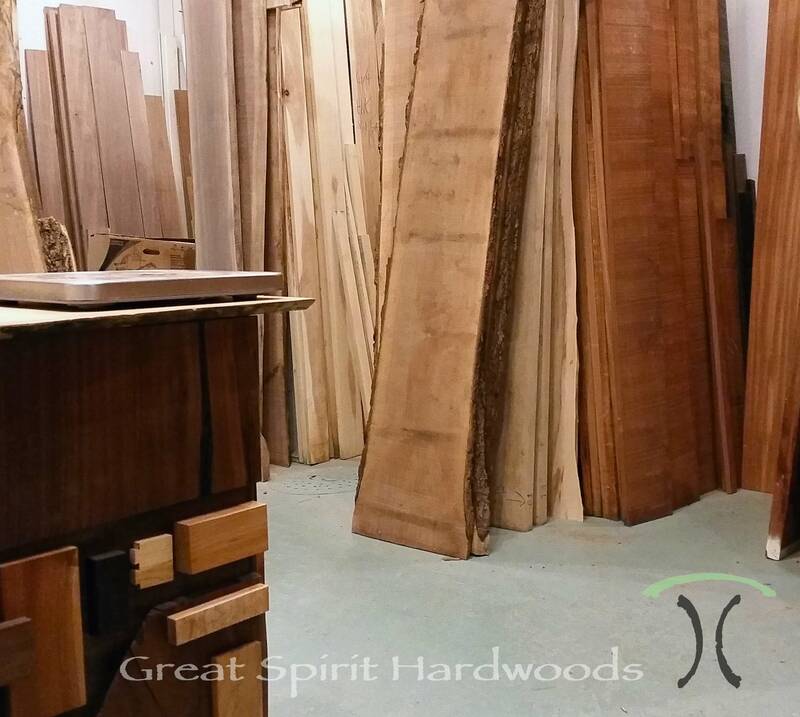 On the other end of the spectrum, contact us for shorts, blanks and other pieces if you build on a small scale project dimension wise and seek quality kiln dried hardwoods without having to purchase full boards. All woodworking services are only available to hardwood purchased from us.